Starting the week of July 9, 2018, the City of Atlanta is implementing new solid waste pick-up days. To verify your new pick-up day, visit www.atlantaga.gov/solidwaste. 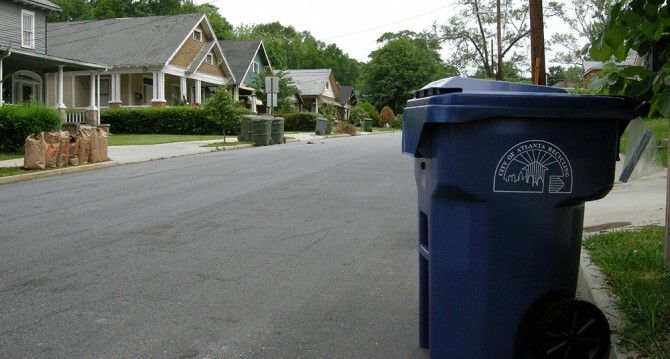 The City of Atlanta’s pilot recycling program has been expanded! Neighbors on the northern end of the neighborhood (Inman Street, Altoona Place, etc) have already enjoyed the big blue recycling bins for a little while now. But as of April a few more streets have been added to the ReCART program. ReCART encourages recycling by giving points for the amount of items you recycle. The more you recycle the more points you receive. Eventually when enough points are collected participating companies give out free goodies – ranging from money off restaurants to free cans of cat food.